"Lower Falls of the McCloud River"
The Lower Falls of the McCloud River is accessible from Fowler's CG. I stayed there in 2007 and did this painting from photos when I got home. Ann had passed a year earlier and I was pretty much of a mess. I spent a morning hiking to the Middle Falls, then just sitting by the river and watching the water flow around the rocks. I noticed how it flowed around the obstacles in it's path and continued on it's way. It was a very spiritual and healing day for me. The McCloud River is a sacred place and has offered water, protection, and food for the Winnemem Wintu. They thrived on the rich supply of salmon and other fish. In 1874 a traveler reported..."a party of six Indians on McCloud's Fork speared over 500 salmon in one night!" Present day Winnemem Wintu people are still very connected to the River..."It is our life blood that flows from the mountain down to the people below"...Mark Franco, Headman, Winnemem Wintu Tribe. The Winnemem Wintu name for the Lower Falls is Falls Where the Salmon Turn Back. 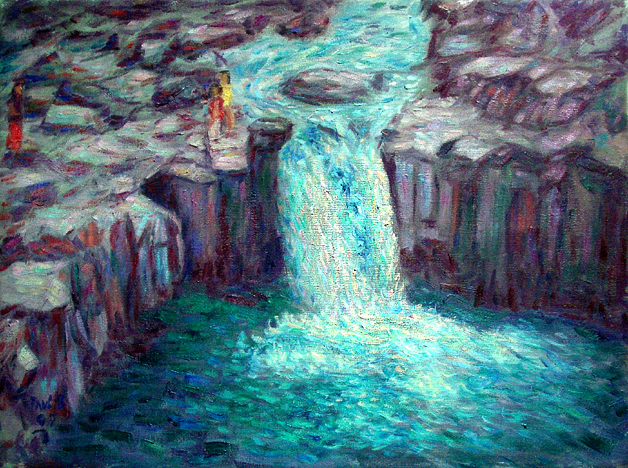 PaulB's Pointillistic/Impressionist original oil paintings of California Waterfalls and various prints and poster formats of a wide variety of subject matter by the Pointillistic/Impressionist oil painter from landscape/waterscape paintings, dance, sports, portrait, to classical figures, flowers, rock and roll, Waterfalls, and California paintings and prints are available for purchase for as little as $24.95 for an 8" x 10" matted print on photo pape. Pointillistic/Impressionist Giclee prints of Waterfalls of California and more on real canvas or heavy watercolor paper are available. One of a kind California Waterfalls embellished prints, which are Giclee prints retouched in genuine oil paint by PaulB. Unless noted PaulB's original Pointillistic/Impressionist oil paintiings are oil on canvas. Paul Berenson's pointillistic/Impressionist oil paintings are in privale collections around the world, including the downtown Los Angeles Athletic Club and have appeared in numerous publications, including the New York Philharmonic Playbill. PaulB.com also builds websites and PaulB is a member of the LA Web Professionals Group.